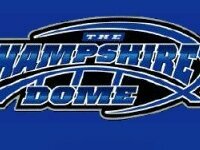 The Hampshire Dome offers the best indoor sports complex in New England. The Dome is a 94,000 thousand plus square foot arena covered by an air supported roof. It is located in Milford, NH.